There, I said it, now we can be done with this blog and you go on with your day. Or...I can just go into more details by what exactly I mean. 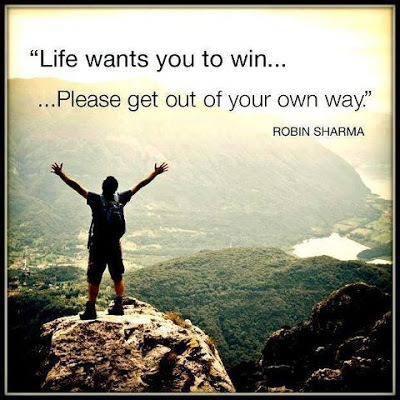 You're in your own way from achieving greatness in your life. You don't think you are but the reality of it is, you hinder yourself everyday. We live in a world where we are constantly looking for a stamp of approval or acceptance into whatever we feel is important to us. We want to be accepted, we want to fit in with a specific group or crowd and do things at whatever costs to garner attention. Most of this is done through social media (which is a fictitious world of melancholy and happiness when that's not reality). So we look for acceptance from people to do something or work toward a goal. A perfect example of this is, going to a person you love and care about the most and asking them what do they think of a certain idea you have for a book or a business. What you're hoping for and expecting is a positive answer where you can take that and run with it because you got your, "stamp of approval." Once you have that, you're good to go but why do you have to do that? What bothers me about that is, you shouldn't need a stamp of approval or acceptance for anything that you want to do in your life. You have to just do it, you have to make the decision to stop looking for approval from everyone. The world has programmed our minds to be leery or worried about what others will say and think. The reality is everyone is going to have an opinion, it's a matter of whether you take them at face value or you just don't give a damn. You have to carve your own path and embrace the journey. No one can live in your shoes and do what you want. At the end of the day, if you succeed or fail, it will be on you. If people don't believe in you, that's fine, don't go out of your way to try and prove them wrong to say, "I told you so." Do it because it's your passion and it's going to make you happy. Be mindful that the world is structured to keep you in a certain place of mediocrity. Don't let that be you. My books are on the website and my podcast The Aquarianmind Podcast is available for your listening. I discuss societal issues that are currently going on in the world today.